Prunus stem pitting affects many of the stone fruits. Plum Prunus stem pitting is not as common as it is in peach, but does occur and can have a negative impact on the crop. What causes plum stem pitting? It is actually a disease more commonly found in the Nightshade family as tomato ringspot virus. There are no resistant varieties of Prunus at this writing, but there are a few options to control and avoid the disease in your plum trees. The symptoms of plum stem pitting may not be noticeable at first. The disease takes a while to take hold and causes puny trees. It most likely lives in the ground and needs a vector to transmit the virus to the tree. Once there, it travels in the vascular system and causes cellular changes. Plums with stem pitting show signs of root problems but they may be confused with such things as mouse girdling, nutrient deficiency, root rot, herbicide damage, or mechanical injury. Initially, the trees will seem smaller than expected and leaves will cup upward at the rib, turning several different colors before settling on purple and dropping. After a season, the effect of stunting will be very obvious as the trunk and stems are girdled. This prevents the passage of nutrients and water and the tree slowly dies. When we investigate what causes plum stem pitting, it is curious that the disease is primarily one of tomatoes and their kin. How this disease gets into a Prunus genus seems a mystery. The clue is in the soil. 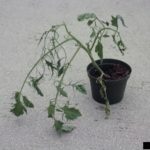 Even wild nightshade plants are hosts of tomato ring spot virus. Once infected, they are hosts, and nematodes transmit the virus to other susceptible species of plants. The virus can survive in soil for several years and is moved into trees by dagger nematodes, which attack the roots of the plant. The virus may also come in on infected rootstock or weed seeds. Once in an orchard, the nematodes spread it quickly. There are no varieties of plum that are resistant to the virus. However, there are certified disease-free Prunus trees available. Control is best achieved through cultural practices. Steps to take are preventing weeds in the area, which may be hosts of the virus, and testing soil prior to planting for the presence of nematodes. Avoid planting where the disease has occurred before and remove trees that are diagnosed with the disease immediately. All plums with stem pitting must be destroyed to avoid spreading the disease.